Yesterday I woke up and went to the kitchen to make my coffee. We have a craft table in the kitchen, which I garbage picked a few months ago on a walk. (We were a few blocks away from home when I spotted it on the curb ready to make its trip to the landfill. I could hear the garbage truck a few blocks away. We live in a town where some people believe it is acceptable to throw away a pristine-condition $50 craft table, and some people think it is acceptable to make your 5-year-old son push your 2-year-old daughter home so you can carry an oversized, awkwardly shaped table two blocks down a large hill and up another so you can have it. To each his own.) I never intended the table to stay in the kitchen, but after having it bang on my shins for 2 blocks, I set it down, and there it stayed. So, back to my coffee. I used to check my personal emails as my coffee brewed, but I got a little sick of waking up only to zone into the world that fits in my pocket and beckons my attention all day. Instead, I now either tidy up the kitchen so it bothers me less throughout the day, or, if Vivvi is awake with me (and she often has been the impetus for my awakening), we sit on the kitchen floor. I lean against the sink cabinet with my knees up, and she, being the most comfortable person in the world, slides into my lap and fills whatever space remains between my arms and the V of my knees and my torso. She lounges there, and we either sit quietly, or look out the window, or I just listen to her random thoughts. When we sat there yesterday, I looked at the aforementioned craft table. I noticed for the first time that the night before, she had been coloring before bed. 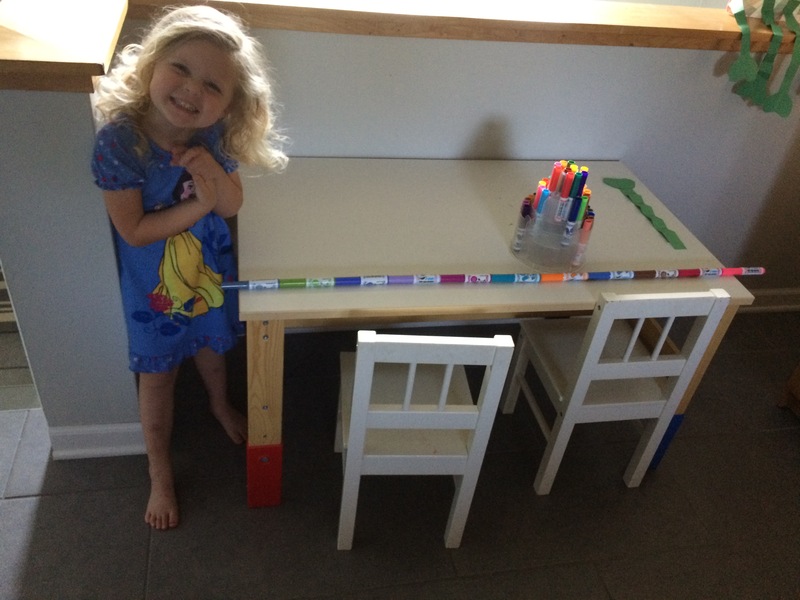 She noticed the markers could attach end-to-end, so she lined them up across the front of the table as far as the markers could go. “Did you do that to the markers?” I asked. “Yep! It’s a train. It’s like a balance. It’s a diving board,” she said. Then she started babbling about the pool yesterday, and the big kids she watched jumping into the water. I didn’t pay much attention because my mind was blown. Where I saw markers in a line, she saw a mode of transportation, a measuring device, and a memory of something exciting the day before. She saw them all at once, and listed them in such rapid succession that I could hardly keep up. What an exciting world these kids live in, I thought. Oh, to have a mind like that. When do we lose our ability to think like that? And why? This makes me think of all of the words Vivvi misuses. She calls the pool “vacation” and her swimming suit her “suitcase.” (She wanted her piggy pink suitcase at the pool the other day, and she yelled to her dad, who was working from home, that we were going to vacation.) This tells me we need to travel more. This also made for a very disappointing visit to the pool that day, when we arrived to find it closed due to lightening in the area. Upon our return, she yelled down to daddy, “Vacation was closed!” To Vivvi, the bank is the “piggy bank,” a belt is a “seatbelt,” “yesterday” is “lasterday,” and “tomorrow” is “nexterday.” I have adopted the latter into my own vocabulary, because, let’s be real, it’s way better. And why can’t tomorrow be nexterday? Try using it. Everyone will know exactly what you mean. As I started to explain to him that birds speak bird, not English, I was a little sad. I don’t want to be the one who eliminates eavesdropping birds from his thoughts. Instead, I wanted to believe again that the robin cared what we had to say. The fact that he believed a bird could overhear our conversation made me think how innocence and imagination are closely connected. I want him to keep both. And finally, it made me think of a car ride I had with Wally on a particularly curious day. We were driving for 10 minutes, and he asked me “Why did God make an asteroid to kill the dinosaurs?” and “Do penguins live in Colorado?” and “Why is light yellow?” and “God made us, right? So who made God?” I needed a nap when I got home. He has all of these questions because his brain has room still for all of the things he doesn’t know. He is trying to fill up those empty spaces. But those empty spaces are also responsible for his belief that a bird could hear us, and for Vivvi’s creative word choices. Adult brains have been filled with answers to questions. Some of these answers are logic, science, reason, and the truth—real knowledge. But adult brains are also filled with things that the world tells us is true, but that might be wrong—that image matters, that difference is scary, that the more you have, the better or happier you are. Our minds are clogged up with worry and fear—that people will think bad of us, that we might not have enough, that things might not go exactly as we’ve planned. And because of all of this garbage, and because the garbage seems real, we run out of space. We run out of the space to think like a child. When I hear “think like a child,” I always think of a church with Children’s Time. I love a good Children’s Time, and it’s not because of the cute lesson. It’s because, when the kids are called up, usually at least one of them falls flat on his face. If this happened to an adult headed up to the front at church, it would stop the service in its tracks and it would mortify the adult for life. But when it happens to the kid, they just get up and keep on running. Yes, our children can remind us. Our children, with their crazy metaphors and words and questions—they can get us back to what it means that we should think like a child. They are poets. They are onto something. We should try to be more like them. I pretty much did the “fall flat on your face thing” a couple years ago at our old church and I could have cared less, although the other adults were ready to help carry me out. Perhaps when you get old a lot of those adult embarrassments or thoughts kind of go out the window, cuz you just don’t give a rip anymore. Things like walking farts, open “barn doors” and chocolate on your face just don’t seem to be that big a deal anymore. Now if I could just get Wally and Vivi’s creative thinking back in my head. That’s probably about the time you take my car away and put me in a home. I loved your “filling the empty spaces” analogy…..Unfortunately, when one reaches the nineties it gets more and more difficult to recall what’s in those filled- in spaces. Your blog posts are a space-filling bonanza!